Insects are small ectotherms with little ability to generate and maintain body heat. Despite this obvious limitation, insects colonized almost all terrestrial and freshwater habitats on the Earth, including frosty ends of Arctics and Antarctics. The evolutionary success of insects was based on their ability to evolve complex and efficient strategies for survival at low body temperatures. In our laboratory, we conduct experiments on whole array of biochemical, physiological and molecular adjustments that counteract damaging effects of subzero temperatures. In terms of cold tolerance, some insects are unique among all animals. For instance, larvae of the malt fly, Chymomyza costata survive submersion in liquid nitrogen (-196°C). Knowledge on mechanisms that underlie such fantastic cold-tolerance can help in development of new techniques for cryogenic storage of biological material. Head: prof. Ing. Vladimír Košťál, CSc. doc. RNDr. Magdalena Hodková, CSc. 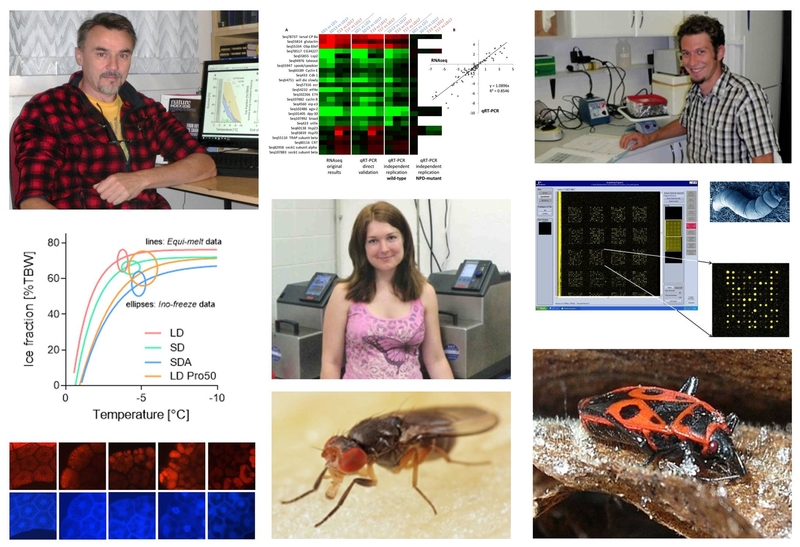 University of Western Ontario, Sinclair lab. ; Aarhus University, Overgaard lab., Holmstrup lab. ; Osaka City University, Goto lab.